Already a marathoner, she was unbelievably diagnosed with Stage 4 Breast Cancer! With Dr. John McDougall’s help, she refused chemo, radiation, & hormone blockers and went vegan. The results of the dietary change were so powerful that, not only did she beat the cancer, she then added biking, and swimming. Exactly two years later, she crossed the finish line of the Kona Ironman Triathlon, becoming the first vegan to do the Ironman. 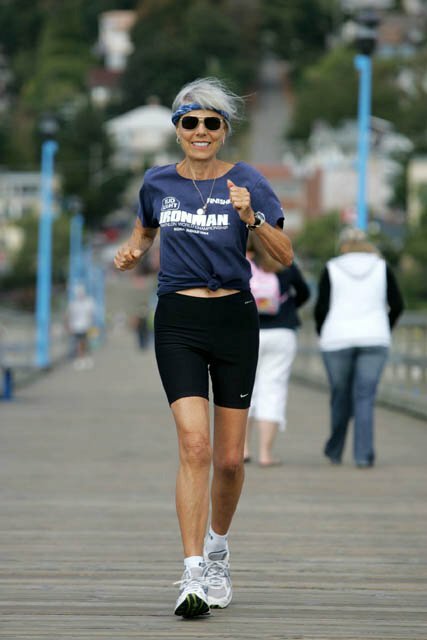 At 83 years young, Ruth Heidrich, Ph.D., went on to do the Ironman 5 more times and is the winner of more than 900 trophies, 8 Gold Medals in the U.S.Senior Olympics, and 67 marathons including Boston, New York, & Moscow. Named One of the Ten Fittest Women in North America, she is a breast cancer survivor and author of A Race for Life, Senior Fitness, The CHEF Cook/Rawbook, Lifelong Running: How to Overcome the 11 Myths of Running & Live a Healthier Life, and her latest book, Cure, Reverse & Prevent ED: Ten ways to Total Sexual Fitness. “Ruth Heidrich is an inspiration to so many people. Her persistence, her commitment to fitness, her use of the healthiest food, and her consciousness of what could be a bright future for all of us make this book a must read.” — T. Colin Campbell, Ph.D., Professor Emeritus of Nutrition, Cornell University, New York Times bestselling co-author of The China Study and author of Whole. Got a question you would like to ask Dr. Ruth?